The monastic order of the Cistercians was first founded in Citeaux (France) in 1098 by the group of benedic-tine monks : Sts. Robert, Alberich and Stephen. Overwhelmed by the spirit of zealousness in observing the rule of St. Benedict from Monte Cassino, they founded a monastery in Citeaux, which in Latin means Ci-stercium. The name of die order - Cystersi originates from the name of that French town. Św. Bernard - wielki czciciel Najświętszej Maryi Panny. In 1222 the Cistercians were brought to Mogiła (the name of the village stems from the grave of Wanda -the legendary daughter of Count Krak), and which now is included in the district of Cracow called Nowa Huta, by the Bishop to Cracow, Iwo Odrowąż from the Silesian town of Lubiąż. They built the church under the invocation of the Assumption of the Holy Mother and St. Vaclav, and the monastery in roman-gothic style. The church was consecrated in 1266 by the bishop to Cracow Jan (John) Prandota in the presence of Count Bolesław, his wife St. Kinga And numerously gathered worshippers. The sculpture of the crucified Jesus, which was placed in the church, soon became famous for good graces and miracles. Many pilgrims were attracted to Mogiła to the feet of the Miracolous Christ, among them bihops, cardinals, kings and sovereigns such as Kazimir the Great (Kazimierz Wielki), Vladyslav Jagiello (Władysław Jagiełło) or St. Queen Jadwiga , but above all, the pious country folk, who came by the thousand throughout the years. The Cistercian monks from Mogiła brought the surrounding area into cultivation. They dried the flood waters and swamps, they used the waters of the Dłubnia river to set the water-mills and the fulling-mills going. Moreover, they built the wooden church of St. Bartło-miej in order to carry on their priestly work among the local people. The presently existing church dates back to the XVth century. Because of the fires, the monastery-church underwent certain reconstructions. The chancel, the transept and the chapels next to the sacristy remained in the original style. 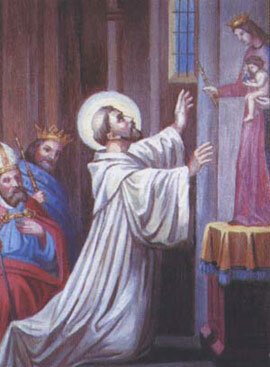 The main parts of the church owe their polychromy to a Cistercian monk, S. Samostrzelnik. He painted the scenes from the Annunciation in the chancel and the ones showing the Crucifixion in the cloister and above the vestry. He also decorated the ceiling of the medieval library. The facade was rebuilt in the XVIIIth century in the baroque style, and so was the altar in the Holy Cross Chapel. The polychromy of the main nave and the lateral naves dates back to the year 1919, and was created by a Cracowian artist-John Bukowski. The figure of the Miracolous Christ is 192 cm tall and is covered with polychromy. It has natural hair which , according to the legend, was supposed to grow. The hips are covered by a piece of golden, embroidered material. This is the voto of the nobleman Żółtowski for being saved from the masacre made by the Turks in the battle of Cecora in 1620. Over the centuries people, being thankful for the graces and miracles, brought numerous gifts, later robbed by the Tatars, Swedes and Austrians. The ones we can see today have been brought recently by the grateful worshippers of the Mogilian Jesus. The monastery chronicals and stories say about the exeptional graces and miracles experienced by the praying people. Some of them are mentioned in the brochure called "The short story of the Miraculous Christ from Mogiła". The high altar, made of stone, is the reconstruction of the old roman one. Over the high altar there is a late-gothic carved triptych from 1514. In the middle of it there is a statue of the Madonna-and-Child. On both wings there are scenes from the life of the Holy Family and the pictures of the Passion of Christ. What is more, in the monastery corridors we can observe the precious remainings, among which is a triptych from the XVth century showing the Madon-na-ancl - Child and the Saints. In 1970, Pope Paul VI promoted the Monastery-Church to the rank of Basilica Minor. Pope John Paul II , on June 9, 1979 came to the shrine to pray. Since that event, even more pilgrims have been coming, especially for the night prayers on the first Friday during the Indulgence Celebrations of the Heightening of the Holy Cross, which last from 14 till 21 September. The main celebration takes place on Sunday, at the outdoor altar on the John Paul II Square, around which are placed the stations of the Passion of Christ. In 1998, during the Indulgence Celebrations we thanked God for 900 years of existence of the cistercian order in the Catholic Church Nowadays the Cistercian monks live on five continents, and together with the cistercians-trapists, there are about 4500 of them. They serve people and God with their common and individual prayer.